(Energy Analytics Institute, Pietro D. Pitts, 24.Nov. 2018) — Venezuela is suffering a complete meltdown across all sectors. The Venezuelan oil sector, which generates upwards to 95% of the country’s foreign currency revenues, is in a precarious state to say the least as oil output continues its downward trend. Interesting enough, the declining oil output trend continues to push the country’s reserves-to-production ratio or (R/P ratio) to even higher levels. Venezuela, the country with the world’s largest oil reserves, had oil reserves of 303.2 billion barrels at year-end 2017, according to BP’s Statistical Review of World Energy, while oil production was 2,110 thousand barrels per day (Mb/d), resulting in a R/P ratio of 393.6 years or 393.6x, according to data in the annual electronically distributed publication. Using the same reserves at year-end 2017 and production figures of 1,171 Mb/d for October 2018 as provided by OPEC, the R/P ratio rises to 708.4 years in 2018. 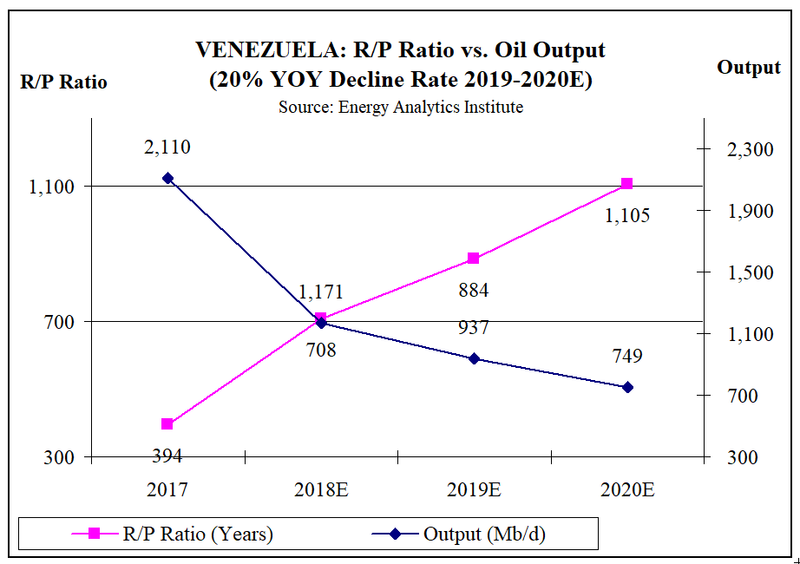 Looking forward to 2019 and assuming an annual decline rate of 20%, unless urgent investments are procured, production in Venezuela could fall further to 937 Mb/d, and push the R/P ratio upwards to 884.5 years. And, in 2020, assuming a decline rate again of 20%, production could fall further still to 749 Mb/d, and push the R/P ratio upwards to a mind-boggling 1,104.6 years. (see chart below where the left axis measures the R/P ratio and the right axis measures oil production). Sources: reserves and production in 2017, BP; production in 2018, OPEC; production in 2019-2020, Energy Analytics Institute. The R/P ratio is an indicator of the lifespan of hydrocarbon resources in years, sometimes expressed as a multiple, given production at a specific point in time. Countries or companies with low single-digit R/P ratios run the risk of literally running out of resources if more reserves aren’t discovered, purchased and/or moved from P2 or P3 categories to the P1 category via enhanced recovery techniques. Trinidad and Tobago, Colombia and Mexico are cases of countries in the Latin American and Caribbean region with single-digit R/P ratios, for a number of reasons. Among E&P companies, pure exploration companies tend to have short R/P ratios. For comparative purposes, here’s how other regional countries’ oil R/P ratios fared in BP’s study, using year-end 2017 reserves and production for the same year: Colombia (5.4x), Trinidad and Tobago (6.7x), Mexico (8.9x), Argentina (10x), Brazil (12.8x), Peru (26.4x), Ecuador (42.7x), and Venezuela (393.6x). Additionally, the R/P ratio for these countries shine light on the a few key countries outside the LAC region: USA (10.5x), Saudi Arabia (61x), Yemen (157x), and Syria (278x). At the moment, no other country has a R/P ratio longer or larger than Venezuela. Simply put, Venezuela isn’t maximizing its massive resource base when compared to other major OPEC reserve holders who are also significant producers, i.e. Saudi Arabia.